Cowpea is one of the major pulse crops of Goa. The crop is widely grown after the kharif crop is harvested under the residual moisture available after rainy season with some irrigations wherever irrigation facilities are available. It is usual grown in sandy areas. The Goa local cowpea popularly known as Alsando is bold compared to other cowpea and has a unique taste and is preferred for culinary preparation. It is a delicacy for many Goans. Alsando gives a yield of around 2000 kgs per hectare. Gregorio is probably the only farmer the state to cultivate Alsando with Drip irrigation which gives him the yield of around 3000 kgs per hectare. The present market rate is around Rs. 150/` per kg. He has availed subsidy of 90% for Drip irrigation and 75% for Bore well he has dug from Directorate of agriculture. 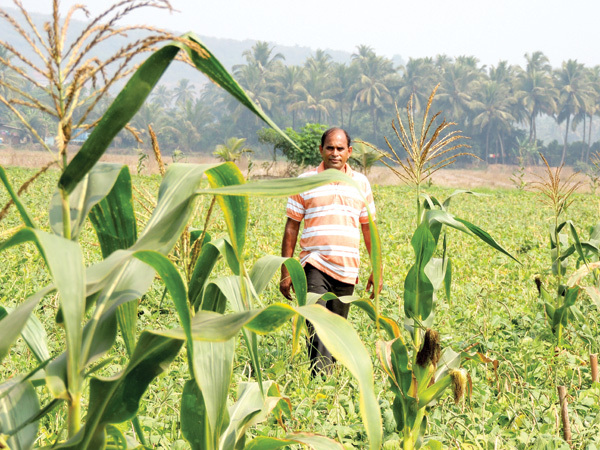 After the season he dismantles the drip irrigation system to make way for cultivation of paddy during Kharif season. He went into farming with the advice of his mother from childhood in a small way. He is growing" Alsando" also known as local local Goan Coupa, also Couliflowers, brinjals, chillies, onions, watermelons and other varieties of vegetables too. Most of his labourers are from UP. He too said he is grateful to Alex Sequeira, Minister of Loutulim constituency who assisted him in supplying harvesters which was given to most of the farmers also in the respective constituency. He too runs an farming related class where in for nearly 8 weekends, classes are being conducted to students and others in farming related activities. He too grows the paddy known as "Dhulapi Utorda variety "
Haryana and Jabalpur too with the help of the department. Further said he is grateful to Nevil Alphonso, District Agricultural officer Salcette and Dattaprasad Dessai of ATMA South Goa and others for their support. They were helpful even on their off days. The hot sun or the heavy rain did not come in their way. Earlier he used to fetch water from river Sal in barrels. A approach by Zonal Agriculture office Margao Datta Dessai last few years back motivated him to go in for Micro irrigation, he suffered losses in the initial ages but now he is making a profit. farming at Cansaulim. He said he spends most of his time as a mechanic which is his main business but farming became his next profession. Gregory every year takes pain in fixing up the drip irrigation system and then removing it after the rains. Gregory believes the youths of today should go in for farming, growing vegetable, flowers etc as there is lot of demand in the market. He also advised the women of today to have at least a small garden near their houses since it will help them. Further Gregory Fernandes advised the students/teachers/principals headmasters and other educational institutions to grow vegetables and flowers,etc if space if available.